It is typical enough of the Castro dictatorship that it prosecutes Cubans for trying to leave the country, and not entirely unexpected. After all, it is an island-long prison that they are trying to escape. But the regime surrenders all claims on logic and justice when it charges those trying to flee with "terrorism." 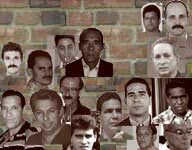 The Castro gulag holds several such political prisoners, guilty of nothing more than rejecting the revolution, including brothers Agustín and Alexis Vigil Muñoz. The Vigil brothers, and several others, were arrested and prosecuted after trying to flee on a boat on June 2, 2003. The next year, they were tried and convicted. Agustín, who is now about 39, was sentenced to 9 years in prison; and Alexis, who is about 30, was sentenced to 8 years in prison. In a 2005 interview, Iraida Muñoz said her sons are not terrorists. "My sons were accused and tried as terrorists, and the only thing they did was to try and leave Cuba," Muñoz said. "They did not attack anybody or kidnap anyone. ... I want the world to know of this injustice, and to know my sons are not terrorists."